What is Carpal Tunnel Release Surgery? Posted by Lloyd Kurth, D.O. What Is Carpal Tunnel Release Surgery? Carpal tunnel release is a surgery that’s used to treat and potentially heal the painful condition known as carpal tunnel syndrome. Carpal tunnel syndrome can be caused by trauma, such as a sprain or fracture, or repetitive use of a vibrating tool. It's also associated with pregnancy, diabetes, thyroid disease, and rheumatoid arthritis. The median nerve and tendons that allow your fingers to move pass through a narrow passageway in the wrist called the carpal tunnel. When you injure this part of the body, swelling can cause the tunnel to press down on the nerve, resulting in numbness and tingling of the hand, pain, and loss of function. During a carpal tunnel release (carpal tunnel surgery) , a surgeon cuts through the ligament that is pressing down on the carpal tunnel. This provides more room for the median nerve and tendons passing through the tunnel, and usually improves pain and function. Reasons for the procedure: A diagnosis of carpal tunnel syndrome is about the only reason to have a carpal tunnel release surgery. And even then, your MOA doctor will likely want you to try nonsurgical interventions first. These may include over-the-counter pain medications, occupational therapy, changes to your workplace, wrist splints, or shots of corticosteroids to the wrist to directly relieve pain. The reasons that a doctor would recommend a carpal tunnel release surgery may include: The nonsurgical interventions for carpal tunnel syndrome don’t bring relief of the pain. The doctor performs an electromyography test of the median nerve and determines that you have carpal tunnel syndrome. The muscles of the hands or wrists are actually getting smaller because of the severe pinching of the median nerve. The symptoms of carpal tunnel syndrome have lasted 6 months or longer with no relief. Risks of the procedure As with most invasive surgeries, carpal tunnel release is not without its risks. You will usually be put under local anesthesia for the procedure, which poses risks for some people. Other potential risks of a carpal tunnel release surgery include: Excessive bleeding at the surgery site Infection at the site Injury to the median nerve or nerves that branch out from it Injuries to surrounding blood vessels A sensitive scar Carpal tunnel release is not a procedure that you can immediately recover from. The recovery process can take several weeks to several months and involves physical therapy to strengthen and heal the wrist and hand. There may be other risks, depending on your specific medical condition. Be sure to discuss any concerns with your MOA doctor before the procedure. Before the procedure Tell your doctor about all medications you are currently taking. You will probably need to stop taking any medications that make it harder for the blood to clot, such as ibuprofen, aspirin, or naproxen. Let your doctor know about any colds, flu, fever, or other illnesses you have had before the surgery. If you’re a smoker, try to quit prior to the surgery. Smoking can delay healing. You will usually be asked not to eat or drink anything for 6 to 12 hours before the surgery. Based on your medical condition, your doctor may request other specific preparations. During the procedure Carpal tunnel release is usually an outpatient procedure, which means that you can go home the same day as the surgery if all goes well. There are 2 types of carpal tunnel release surgery. The traditional method is the open release, in which the surgeon cuts open the wrist to perform the surgery. The newer method is endoscopic carpal tunnel release, in which a tube that contains a camera is inserted through a tiny incision. The camera guides the doctor as he or she performs the procedure. In either case, here is the general sequence of events in a carpal tunnel release surgery: You will usually be asked to remove clothing, or at least your shirt, to allow the surgeon to work more easily. Typically, local anesthetic is used for this procedure to numb the hand and wrist. In an open release surgery, the surgeon cuts a 2-inch incision on the wrist. Then he uses common surgical instruments to cut the carpal ligament and enlarge the carpal tunnel. In an endoscopic carpal tunnel release, the doctor makes 2 half-inch incisions. One is on the wrist, and 1 is on the palm. Then he inserts a camera attached to a tube into 1 incision. The camera guides your doctor as he inserts the instruments and cuts the carpal ligament through the other incision. The surgeon will stitch up the incision or incisions. Your hand and wrist will be placed in a splint or bandaged heavily. Once the surgery is complete, you will be monitored for a short time, and then allowed to go home. Only in rare instances or complications is an overnight stay required for a carpal tunnel release surgery. After the procedure Your wrist will likely be in a heavy bandage or a splint for about a week. Doctors usually schedule another appointment to remove the bandage or splint. After that, most people begin a physical therapy program. The physical therapist will provide you with motion exercises to improve the movement of the wrist and hand. These exercises will speed healing and strengthen the damaged body parts. The recovery period can take anywhere from a few days to a few months. In the meantime, you may need to adjust job duties or even take time off from your job while you heal. Notify your doctor about any of the following: Fever Redness, swelling, bleeding, or other drainage from the injection site Increased pain around the injection site. if you have questions or concerns, please visit this link or call us! Written by Lloyd Kurth, D.O. Dr. Kurth joined Mountainstate Orthopedic Associates, Inc. in May of 1997. Prior to joining Mountainstate Orthopedic Associates, Inc. he attended Tarkio College, and then earned his medical degree from West Virginia School of Osteopathic Medicine. Following medical school, he completed an internship at Doctor’s Osteopathic Hospital in Erie, Pennsylvania and residency in Orthopedic Surgery at West Virginia University. He is a native of New Castle, Pennsylvania and has been practicing in North Central West Virginia for over 25 years. Prior to joining Mountainstate Orthopedic Associates, Inc., Dr. Kurth was a solo practitioner who served the North Central West Virginia beginning in 1984. He is a member of the American Academy of Orthopedic Surgeons and has been certified by the American Board of Orthopedic Surgeons since 1986. Dr. Kurth served in the United States Army in Vietnam with the 101st Airborne and he receive the Bronze Star for valor. 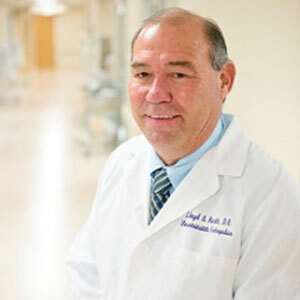 Dr. Kurth served as a clinical professor of Orthopedic Surgery at West Virginia School of Osteopathic Medicine and as a clinical professor of Orthopedic Surgery at West Virginia University Hospital. He continuously updates his training to reflect the most recent orthopedic treatment options and techniques for his patients. Dr. Kurth is a co-developer of Stelkast Proven Knee Arthroplasty and has performed approximately over 3000 knee replacements.